Amazon.com description: Product Description: Donald Trump, the canny deal maker and crowd pleaser, is the third generation of an entrepreneurial family whose turbulent history and extraordinary achievements reflect the transformation of America from a land of scrabbling immigrant survivors to our brand-name era. Donald's German immigrant grandfather Friedrich came to America with one suitcase and limitless faith in his gut instincts. A hotel and saloon keeper who provided miners with shelter and female companionship during the Klondike gold rush, he later opened a storefront real estate operation in Queens, New York. Fred, Friedrich's eldest son, started building houses for neighbors while he was still in high school and was among the first to realize that the New Deal would become America's new gold rush. 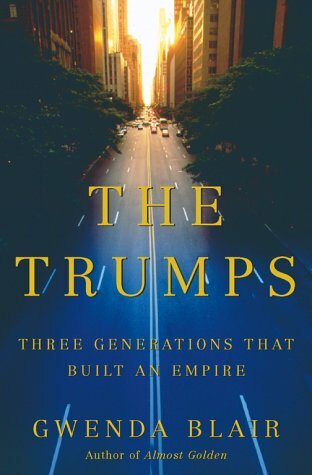 Using government housing subsidies and loopholes, Fred constructed thousands of new homes in Brooklyn and Queens, made a fortune, and provided start-up capital for his second son, Donald. Donald, determined to pursue a career on a larger, and ultimately all-encompassing, stage, set his sights on Manhattan. It was then in a slump. Sensing the beginning of another golden age, the young developer began positioning himself to take advantage of it. His most important asset during what would turn into the go-go years of the 1980s and the economic bonanza that followed in the 1990s was his insight that, this time, fame itself would be the road to fortune. Donald had already learned from his father how to be a real estate developer. Now, endowed with a talent for extravagant exaggeration, he would become a world-famous developer. Feuds, divorces, sexual boasts, presidential bids, billion-dollar triumphs, billion-dollardisasters -- Donald Trump's roller-coaster life would become one of the most remarkable, and remarkably well-publicized, in the nation. He would be among the most renowned, reviled, and envied figures of his time. Such a route is not new in America. But what distinguishes Donald Trump is his understanding that being famous for being rich could make him even richer. Donald Trump would provide an intriguing, infuriating, and unforgettable model for the biggest gold rush of them all, the new virtual economy in which the appearance of enormous success has come to play such a dominant role.